Toyota (GB) have generously donated to Serve On's work in the community. Serve On is going places a little quicker, thanks to the generosity of Toyota and the persuasive talents of International Response Team recruit Edit Nagy. Edit appealed to the corporate social responsibility of her bosses at Toyota (GB) and the car giant’s own charitable trust was quick to recognise what Serve On volunteers are achieving in the community and what they hope to achieve in the future. The Toyota CSR team happily agreed to a £2,000 donation from the Toyota Fund for a Better Tomorrow. The motor manufacturer – whose slogan is Let’s Go Places - invites its staff to put forward good causes for consideration and liked what they heard from Edit about Serve On and the way we hope to expand our network of Community Resilience Teams. Serve On International Response Team member Jay McNeil after completing the Lakeland 100 Ultra Marathon. Edit is not the only Serve On member who has been busy looking for the funding that will help us carry on helping others. 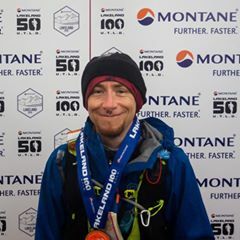 IRT Ops member Jay McNeil has just completed the tough Lakeland 100 Ultra Marathon, in spite of the recent heat, raising money for Serve On – an amazing feat. The main picture is of Hall's Fell, on Jay's remarkable route. Martin Phillips’ plan to do the 5-4-3-2-1 ten kilometre walk from Salisbury next weekend looks puny by comparison although, in his defence, he’ll be doing it in Serve On rescue kit. Benjamin Hille, Vern Young, Andrew Felix and Rescue Rookie Matt Evans are all fund-raising, too and between them and Martin and Jay, have already raised more than £1,000. There’s more news to come on other Serve On volunteers who are finding challenging ways to bring in the money that really can save lives, including the Tough Mudder team who will be soon adding to their already impressive tally.